Delaware County Council joined members of the Delaware County Women’s Commission and the Friends of the Commission on March 27 to honor four local women in recognition of Women’s History Month. Throughout history, women have fought tirelessly to broaden democracy, to ensure all people are treated equally, and to encourage young girls to reach for new heights. March is National Women’s History Month, a time set aside to commemorate and encourage the study, observance, and celebration of the vital role of women in American history. Each March, the Delaware County Women’s Commission recognizes Women’s History Month and honors women in the community at an annual breakfast. The 2019 theme was “Visionary Women: Champions of Peace and Nonviolence.” Four women who have led efforts to end war, violence, and injustice and pioneered the use of nonviolence to change society were honored. The 2019 honorees were Bonnee Bentum, founder, owner, and director of “A Matter of Xpression,” Delaware County District Attorney Katayoun M. Copeland and Hannah Maier, Creator of “Community for Change.” Agnes Irwin was inducted into the Hall of Fame. From empowering young girls in the mid-19th century, to supporting young girls in Ghana, to bringing justice and non-violence to our communities, to beginning a grassroots effort to end bullying in school, these outstanding women exemplify female leadership. 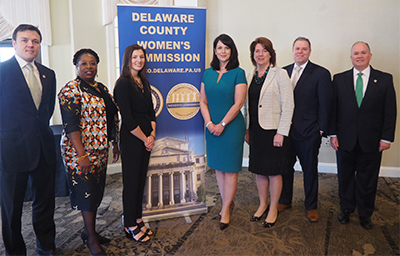 Founded in 1985, the Delaware County Women’s Commission serves as an advisory board to Delaware County Council on issues impacting women and girls in our county. Appointed by County Council, the intent of the fifteen-member commission is to broadly mirror the rich diversity of the county. The Commission studies current issues faced by women and girls and seeks to foster solutions and serve as a catalyst for change.